When your child has severe food allergies, hiring a new babysitter requires extra planning. Here are some ideas and resources to help make the process a success. Don’t wait until the first day you will be leaving your children with the sitter to teach her about your child’s food allergies. Meet with them before this. Pick a time and day when you will not be rushed. Pay the sitter to come over for an hour or two. Use this time for you and your children to get to know her, and teach her what she needs to know about your child’s food allergies. If your child has any other health care needs, such as asthma, make sure to go over those as well. Use this Food Allergy Babysitting and Drop-Off Child Care Form to help you teach the sitter about how to care for your child, how to prevent and how to treat allergic reactions. It contains important food allergy management facts. It also has a section to fill in about your child. Additionally, you may find this handout on food allergy basics to be helpful in teaching a caregiver about managing food allergies in daily life. 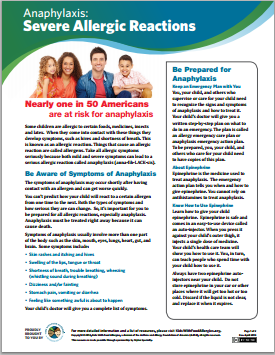 Kids With Food Allergies has a downloadable handout on recognizing severe allergic reactions, known as anaphylaxis. Anaphylaxis must always be treated with epinephrine, which comes in an easy-to use-autoinjector. You must check that your sitter is confident and comfortable with recognizing a potential case of anaphylaxis before leaving them alone with your child. Your sitter must be able to recognize and treat an allergic reaction with epinephrine. Read & Discuss Your Emergency Instructions – Have the sitter read your written food allergy emergency care plan. Discuss this with them in detail. Answer any questions they have and make sure they truly understand your instructions. Practice Using the Auto-Injector – Your child’s epinephrine auto-injector should have come with a special “trainer” device. The “trainer” does not have a needle or medicine. Have the sitter use the “trainer” on their own thigh for practice. Make sure they hold it in place against their thigh for 10 seconds, just like you would with the real epinephrine auto-injector. Show Your Medicine Pack – Show the sitter what your emergency medicine pack looks like and where you keep it. You should also show them where you keep all your regular first aid supplies as well. Go Over Emergency Contact Information – Show the sitter where you keep your emergency contact information. This should include your cell phone number plus the names and phone numbers of nearby friends who they can also call if needed. Discuss Script for Calling for Help – It is a good idea to keep a script on your refrigerator for calling the rescue squad (in the U.S. this means dialing 911). Show the sitter where this is, so they will be able to use it in an emergency. This is a medical emergency. This is (Your Name) at (Your Address) in (Your City). We have a (X)-year-old child with severe food allergies who is having an anaphylactic reaction. I have given him/her a shot of epinephrine. Our nearest cross streets are (Street Name) and (Street Name). Explain Your “No Outside Food” Rule – Explain to your sitters that they cannot bring ANY food into your home. If they get hungry, they can help themselves to the “safe” foods that are in the house. You should also ask them to wash their hands with soap right before they come to your home. Video – Want to learn more about leaving your child in the care of a babysitter? This video is about “Babysitters, Playdates, and Parties: How to Transition Care for Children with Food Allergies.” The program features guest speakers Dr. Michael Pistiner of AllergyHome.org and Dr. Sarah Boudreau-Romano of TheAllergistMom.com. Guidelines for Day Care Centers – National guidelines are available for managing food allergies in school and day care settings from the Centers for Disease Control and Prevention.